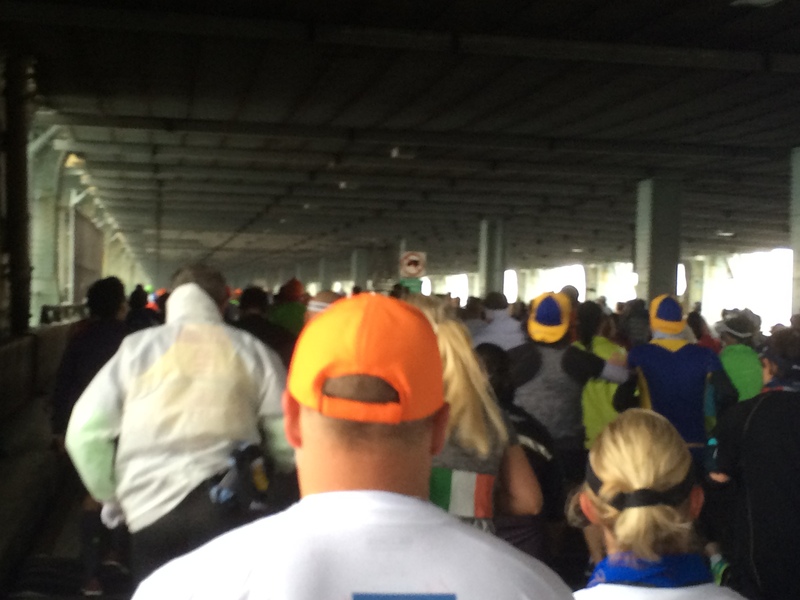 Along the way, we passed the start line for those who were in the corrals that got to start on the top deck of the Verrizano Bridge. Those of us who ran on the bottom had a different first 3 miles. Here we go! This is my start line. The National Anthem was sung, the cannons blasted, and “New York, New York” started playing and we were off! No one ever seems to post pics from the bottom of the Verrizano Bridge. So, I was determined to grab a few pics and post them. 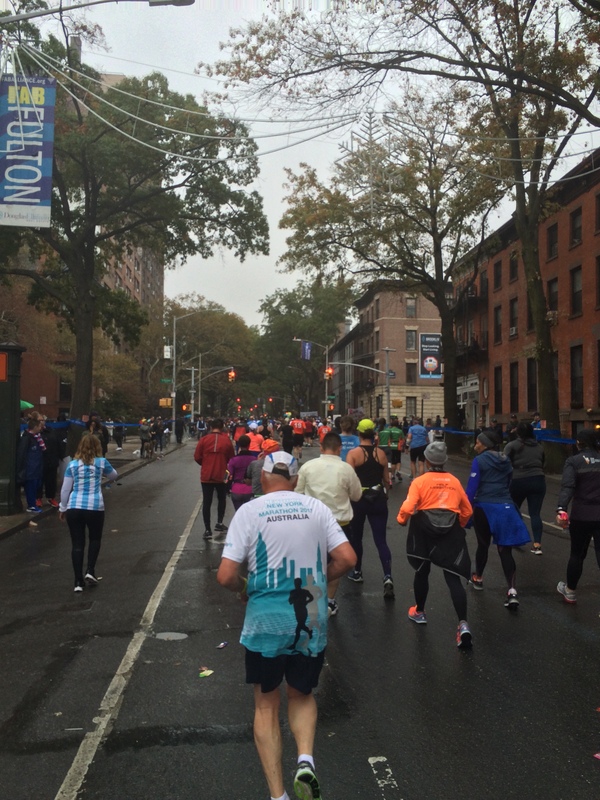 After all, not all of us who run the NYC Marathon get to run over the top. We should be represented in social media as well! 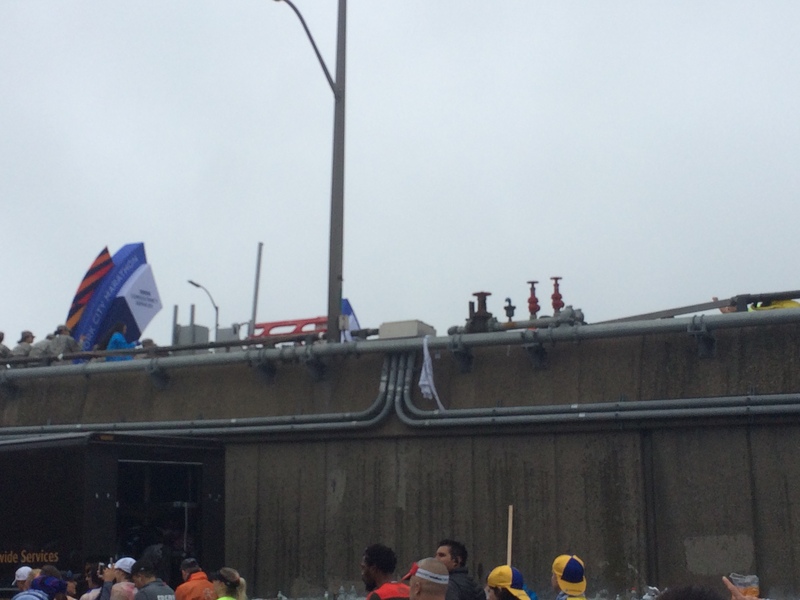 I’m pretty sure that, for the earlier corrals, this boat you see was spraying off water to send off the runners. By the time we got there, it wasn’t so grand. Oh well. The mood of us bottom of the bridge runners was super excited. 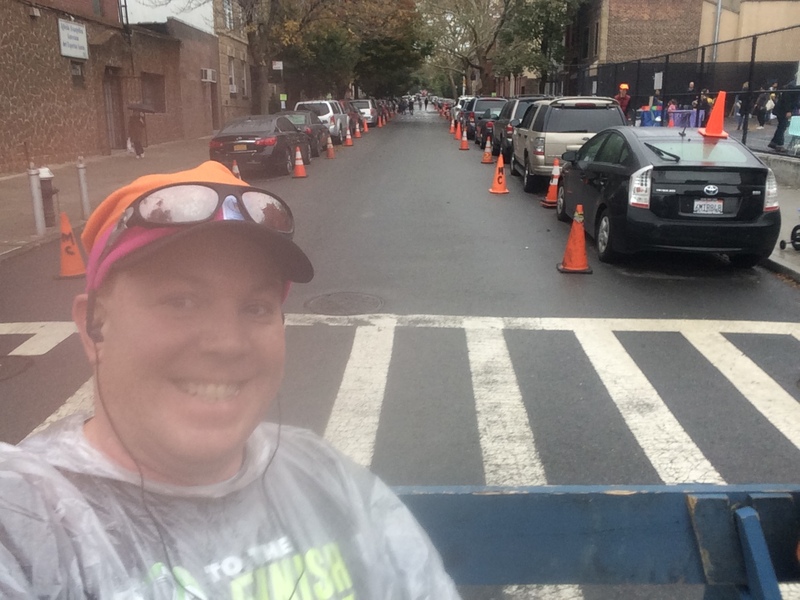 This was mile 1 and everything is good in mile 1! I even saw some other run/walkers who cheered for me as I raised my hand to begin a walk break. They said, “Yay! Run/Walkers!” They ended up being Galloway runners as well! Running the bridge was really fun! 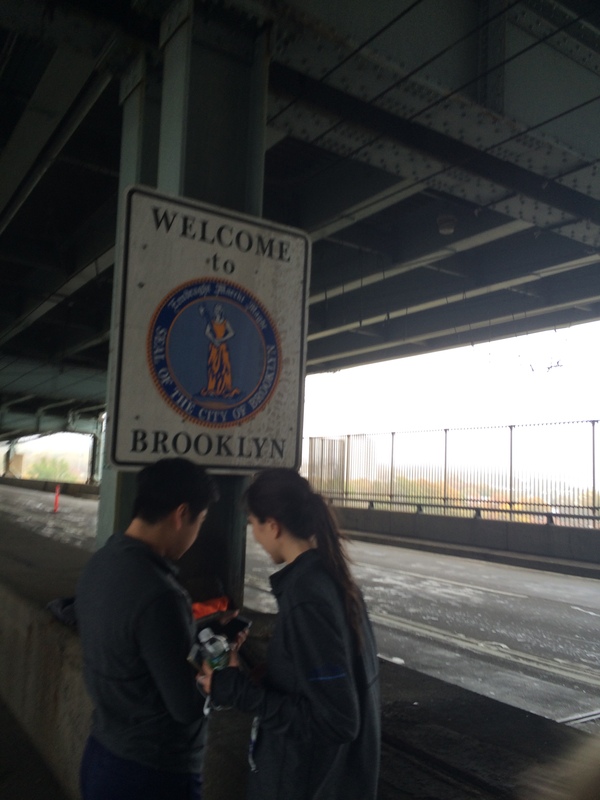 In mile 2 we crossed the official boarder into Brooklyn! We would end up in Brooklyn until the half marathon mark. Of the 5 Burroughs, Brooklyn is the one we’d spend the most time in. 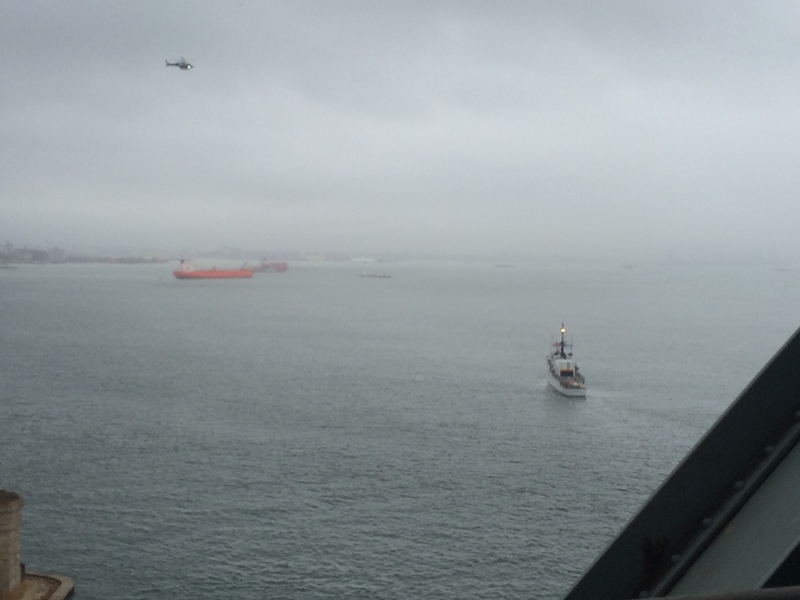 My time on the Verrizano Bridge was interesting. 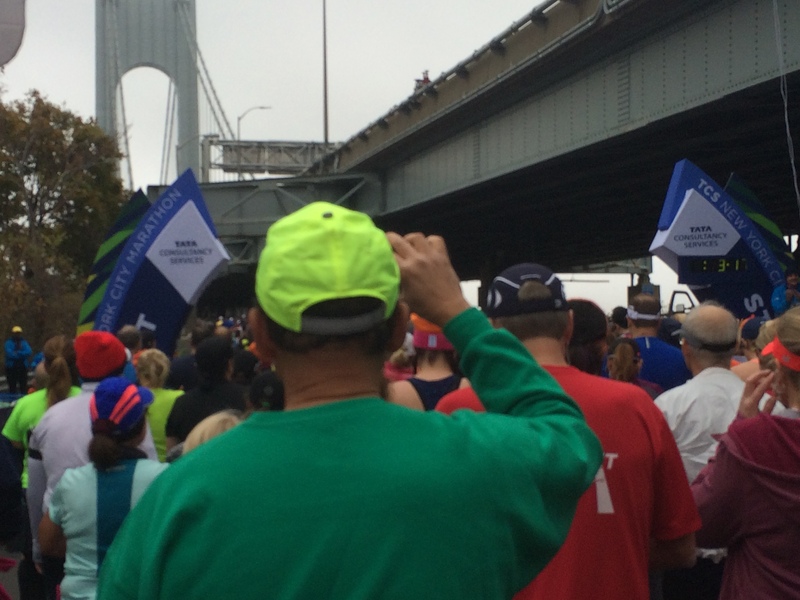 The Garmin watch ended up being behind the mile markers. I passed the first mile marker in around 13:30. However, my first mile according to Garmin didn’t finish until 15:20. When it comes to races, I’ve learned not to get too tied to the watch. It’s always fun for me to figure out how close to the official mile markers the watch is. For this race, it went from being behind the mile markers, to catching up and then going behind them. On the Garmin, I didn’t actually finish the full 26.2 miles. Mile 1 was on the slow side for me, which I was thrilled with! After all, this was the most difficult (on paper) climb of the entire course. So many people had warned about not going out too fast. So, I was pleased with how the first two miles went. 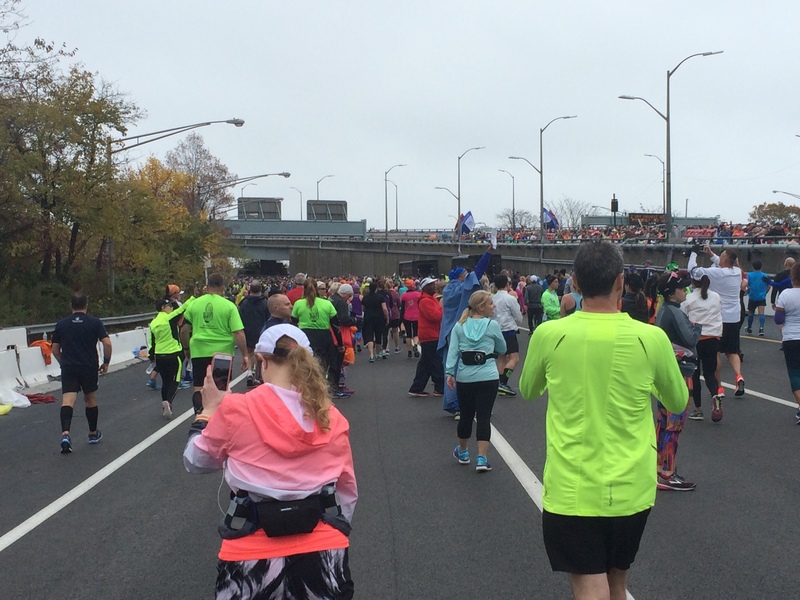 As we came off the first bridge into Brooklyn, there was a small but very supportive crowd. 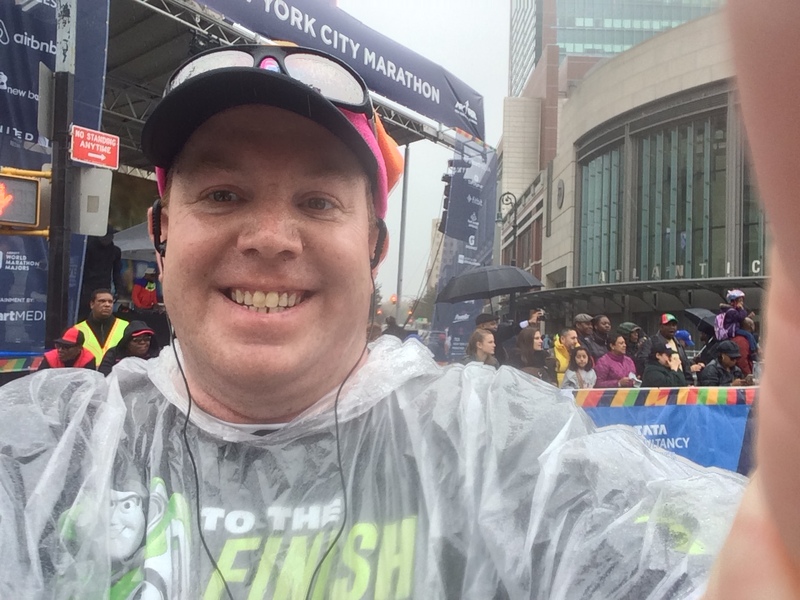 While I wasn’t thrilled with the on again, off again drizzle, I was happy in these early stages of the race. Here are the official splits of the race. At the 5K mark, was around a minute faster than the day before. Everything felt very comfortable. My run 30 seconds, walk 90 seconds was going good. I wasn’t worried at all about my overall time in the early part of the race. This is a picture spot I looking forward to early on is this one. In the seventh mile, we passed the street my mom first lived. She lived on 7th Street and 5th Avenue. 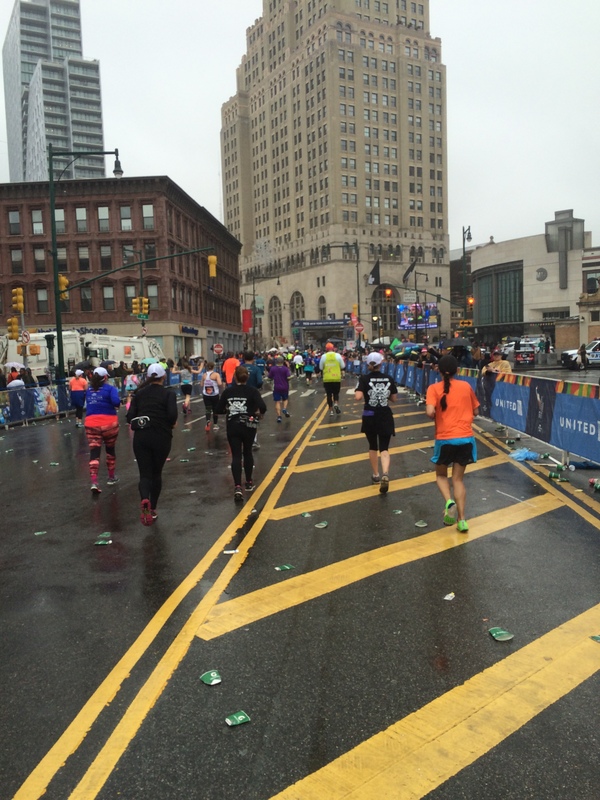 We passed by running up 4th Avenue. So, I can say that, just down this street is the house my mother first lived! Before the race, my mom sent me some of the addresses that were important to her early life. This is the only one we got close to. So, stopping for a pic was a must. 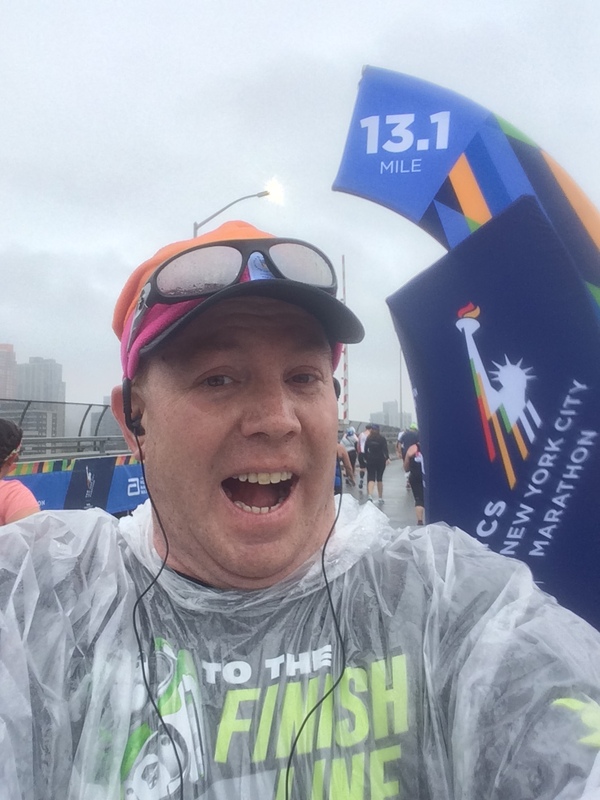 Funny thing about this pic…there was a woman cheering us runners on right behind me. She looked at me really strangely as I stopped for this pic. I told her that my mom lived just down that street. Her look changed to a big smile and she encouraged me to keep on going! Eventually, our long trek up 4th Avenue in Brooklyn came to an end and we had our first turn in forever! 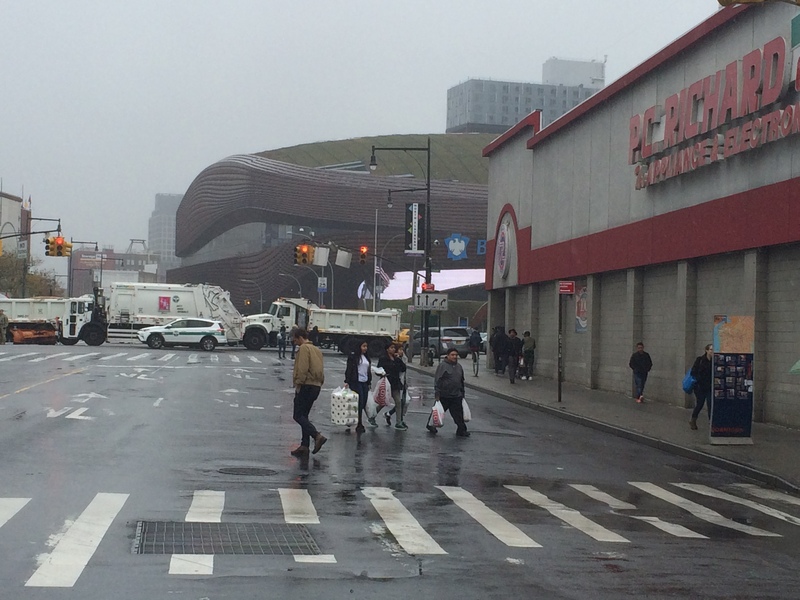 I had thought we would pass somewhere near the Barclay Center in Brooklyn (home to the NBA’s Brooklyn Nets). So, since I could see it, I had to stop for a quick pic. I loved this turn because it felt very much like the big-time race I was running in. There aren’t a lot of these kind of spots on the course (much like Chicago). 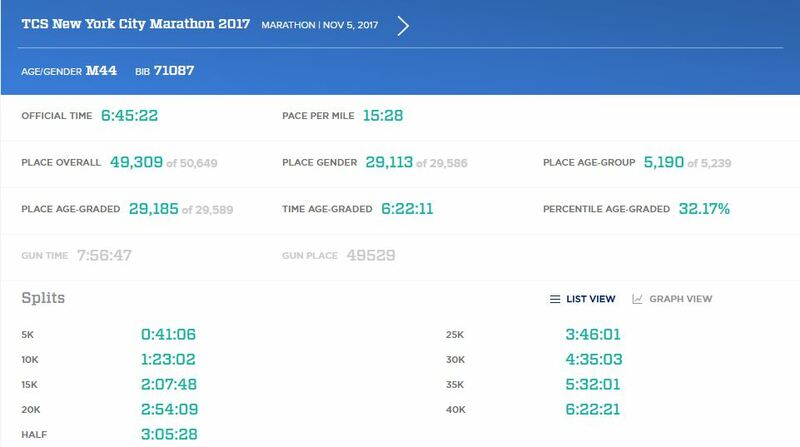 So, going through this part of the course (in mile 9, I think) gave me a real boost of excitement and reminded me that I was running in a World Major Marathon. Yep. 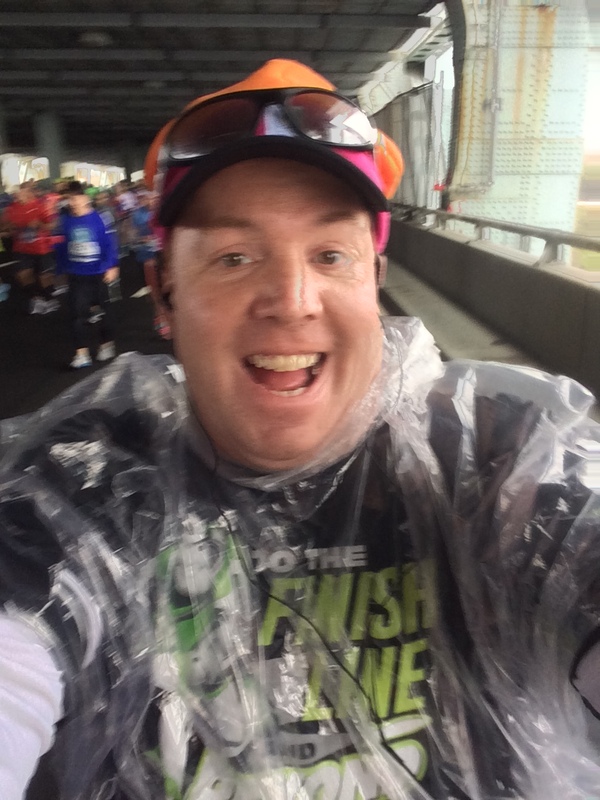 I was a happy camper…well, minus all that rain. If memory serves me correctly, I think we were beginning a slight hill here in mile 9 or 10. When we ran down 4th Avenue, it was pretty flat. However, the rest of Brooklyn had some rises and falls in elevation. 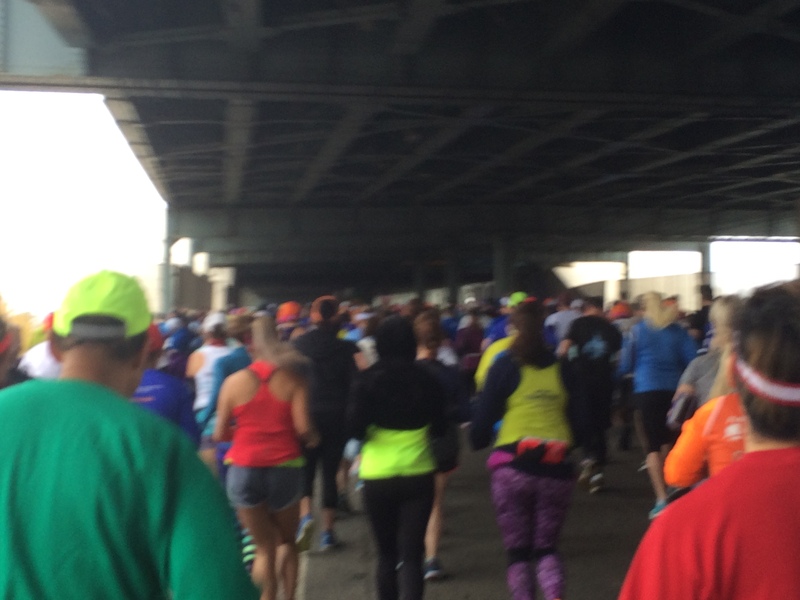 As we made our way through Brooklyn, I was blown away from all the support. Some of the bands had make-shift coverings to keep them dry. There were so many music groups on the course! Just past this group, a church choir was singing on the other side of the street. 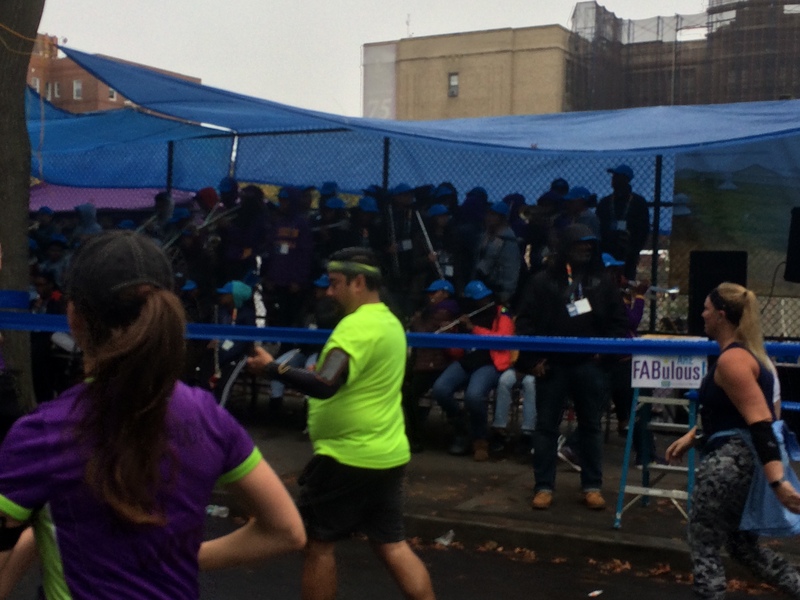 When people talk of the NYC Marathon as one gigantic block party, they weren’t kidding. I had my headphones on. However, I never played the music on my phone. That’s how much crowd support and entertainment there was on the course. 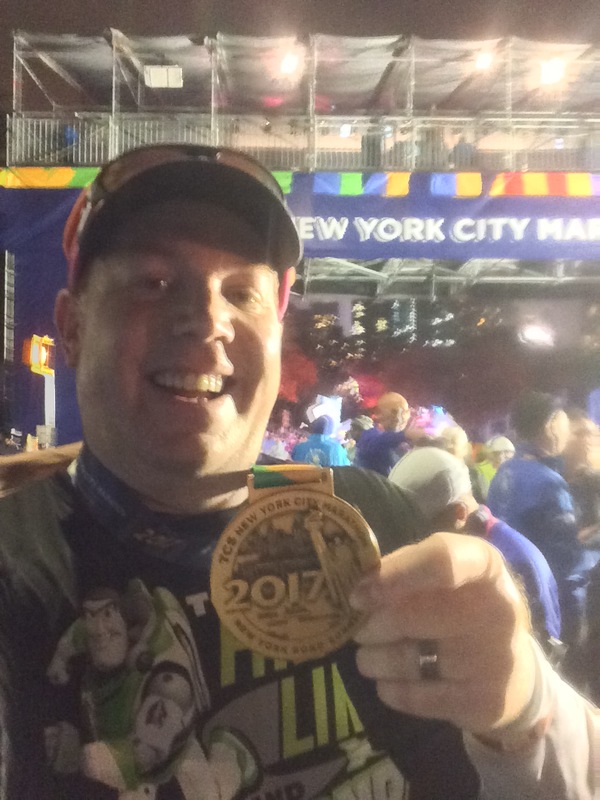 As we approached the end of the first half of the race, I thought to myself how I was pretty much on point with my half marathon times. I arrived at the half marathon point at 3:05:28. It was on this, our second bridge, that I finally broke my run/walk pattern. I walked up the bridge. After all, I was running at a pace that was very familiar. This was faster than my Disneyland Half Marathon time and less than a minute slower than my Rock n Roll San Diego Half Marathon time. 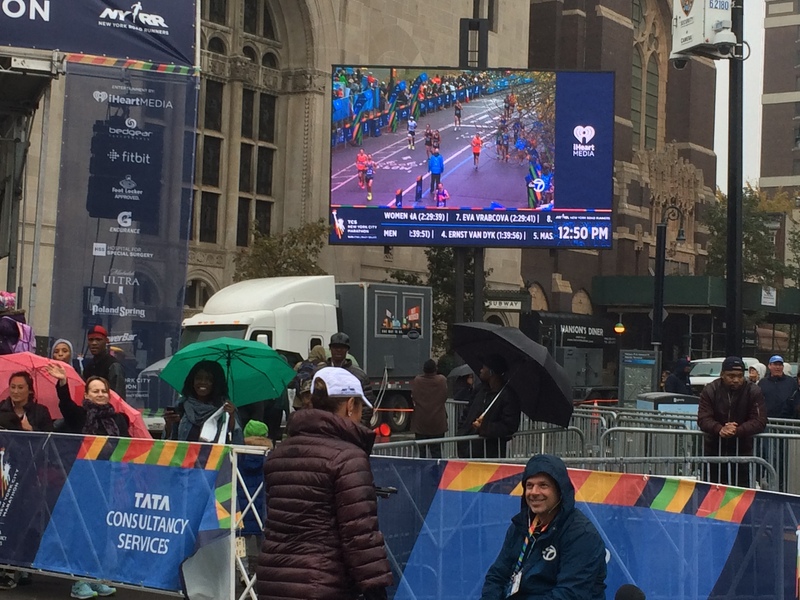 This seems like a good place to end this part of my NYC Marathon recap. Check back tomorrow to see how it all finishes!